McGill's Repair and Construction, LLC | Page 4 of 7 | Servicing Southern Iowa's Electrical, Heating and Cooling needs since 1990. In the past a discount on energy efficient light bulbs was provided by the utility company in the form of a rebate. In 2014 Alliant Energy discontinued it’s rebate program for light bulbs and instead is co-sponsoring the Be Bright program. The Be Bright program allows you to purchase certain light bulbs at a discounted price directly from the retail store. 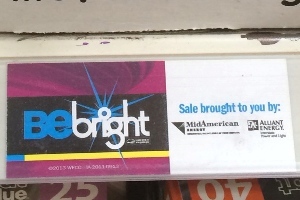 Look for the Be Bright label on the shelf near the price sticker. The benefit is that the discount is applied at the point of sale and no rebate forms are required. Only certain stores are participating in the program. Only certain light bulbs are selected. 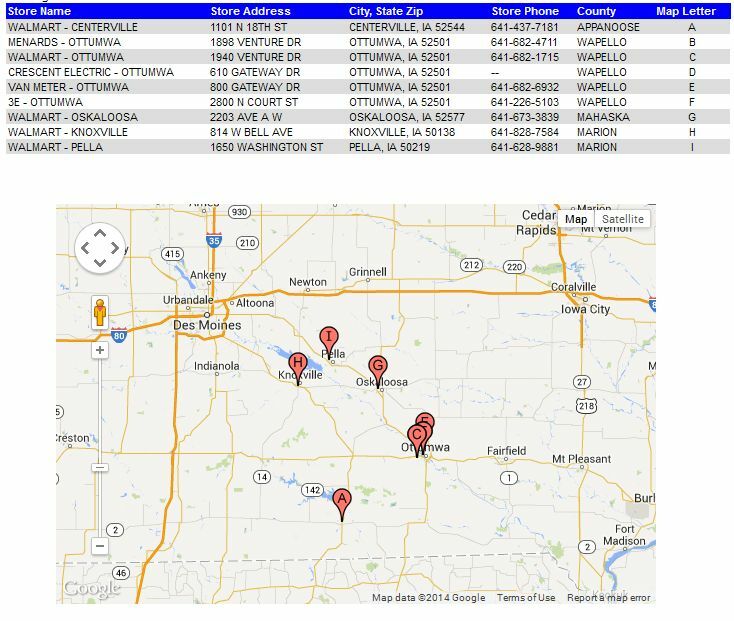 You must be utility customer of Alliant Energy or MidAmerican Energy. No rebates are available other than through the Be Bright program. If the store doesn’t participate or carry the brand/style of light bulbs you prefer then you are out of luck. If your favorite store is not listed above then I encourage you to discuss with the store manager about participating. More information on the Be Bright program can be found at http://www.iowachangealight.com/. Understanding tankless condensing gas water heaters. McGill’s Repair and Construction is a dealer and installer of Navien brand tankless condensing gas water heaters. The Navien water heaters provide an endless supply of hot water using new technology that improves efficiency–an Energy Factor (EF) rating of .95 -.98 compared to .82 for other tankless designs or .55 for tank models. (The minimum EF rating to qualify for Energy Star is .82.) See more information about Energy Star requirements here. Condensing gas technology is what makes Navien’s water heaters more efficient, but what in the world does that mean? A condensing gas type water heater improves the efficiency of the heating by capturing the heat from the exhaust gases created by the burning of the fuel, in this case natural gas or propane. The temperature of the exhaust gas can range from 250 to 450 degrees F and is wasted energy when expelled directly outside. In addition, this high temperature gas requires special vent piping–sometimes referred to as a flue–to prevent damage to nearby structure and potential fire hazards. In a condensing gas tankless water heater there are two heating points, the primary and secondary heat exchangers. The role of the heat exchangers is to transfer heat from the source to the item being heated, i.e. the water. The primary heat source comes from the gas burners used to heat the water to the desired temperature. The hot exhaust gases that are created are then used as the secondary heat source to preheat the water prior to the primary heater (so in this case the meaning of secondary is: resulting from something else that is primary, not comes after). A diagram of how the Navien tankless water heaters works is available here. As you can see the water travels through the secondary heater, is preheated by the exhaust gases from the primary heater, and then travels on to the primary heater where it is further heated to the desired temperature by the gas burners. As a result of transferring heat from the hot exhaust gas to the water by the secondary heat exchanger, the exhaust gas is cooled. When this gas cools to its dew point it changes state into a liquid–a slightly acidic water–that can then be routed to a household drain. The condensing nature of the exhaust gas when cooled is the reason why it’s referred to as Condensing Gas Technology. Another benefit of reducing the temperature of the exhaust gas is that it allows for simpler vent piping, in many cases just a 2″ sch 40 PVC drain pipe. 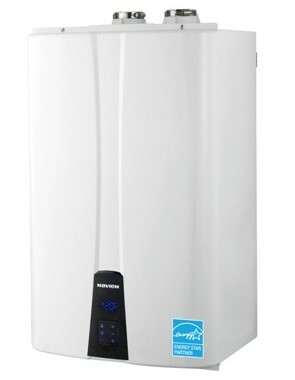 If you would like more information about the Navien tankless water heater please contact David McGill at 641-437-1086. McGill’s Repair and Construction, LLC is a licensed contractor for HVAC and Refrigeration. Licensed by Iowa Plumbing & Mechanical Systems Board as required by Iowa Code. Member of Refrigeration Service Engineer Society (RSES).